Happy Book Birthday to Anthropoidea! This week my friend K.L. 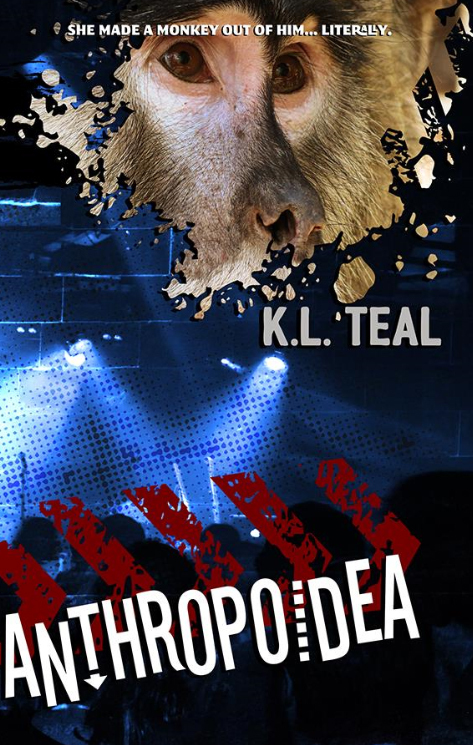 Teal (also known as T. Damon) is celebrating the release of her new book, Anthropoidea, a fun YA urban fantasy, and I’m helping her celebrate with a guest post and giveaway! When Garrett upsets a witch during an interview for a senior project with his best friend and secret crush, Stella, a simple assignment that should be a dream come true turns into a nightmare. Garrett awakens the next morning to find that he’s been cursed—turned into a monkey! As Garrett settles into his new body, he starts to experience his family, friends, and even himself in a new light. But is he doomed to stay a monkey forever? Anthropoidea is a magical story with elements of Hawaiian mythology incorporated throughout. I’m going to pass it over to K.L. now so she can tell you all about her inspiration for the book, and how she drew from her own family and life experiences to create her characters! Anthropoidea, though dear to my heart, was a book that I was never certain that I would release. It wasn’t that I didn’t think people would enjoy it, I just thought that the book itself was so random that nobody would be interested to even pick it up. Typical writer thoughts, I know. All it took was my own pressure on myself to put out another book to make it happen. And here we are. 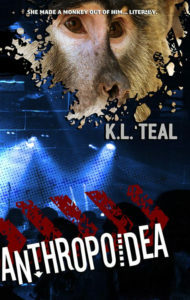 When I started writing Anthropoidea, I had no idea how it would end, who the characters would be, or even anything aside from the general plot—that a teenager would have a curse put on him that would transform him into a monkey. How I came up with that, I do not know, but perhaps it has something to do with my own feeling of transformation when I write. Whether consciously or not, I have the tendency to put bits, pieces, or even sizable portions of my life into my stories. Every character I create embodies at least small elements of me, though sometimes painfully obvious, and sometimes only noticeable to me. Actually, a lot of the times I don’t even realize I’m doing it, until I reread what I’ve written, and sometimes other people notice it and I fail to at all. Take for example, Garrett. His Hawaiian heritage is inspired by my own, my mother having been born and raised in Honolulu (before it was even a state!). She moved to San Francisco in her early twenties and became a teacher, met my father, and eventually had me and my siblings. My mother is full Korean, and my father an eccentric amalgam of European blood with just a hint of Cherokee. Garrett’s mother is Hawaiian, and his father a “haole”, just like my dad. I grew up hearing various words of the Hawaiian pidgin dialect (mostly naughty words, might I add) yelled1)Side note: It is yelling! Though in a jovial, playful teasing kind of way. But still loud! I remember my uncle used to scream “Hey haole!” at the top of his lungs to my father in crowded places just to embarrass him. I’ve had family yell “Eh!” at me probably a billion times, and now I find myself doing it to my own daughter. at me throughout my life by my mother and her side of the family: a melting pot of Koreans, Hawaiians, Japanese, Chinese, and hapa-haoles (hapa means half, like I’m a hapa-haole) who still live on Oahu. I’ve picked up on enough Hawaiian words to create the foundation for the dialogue of Garrett’s grandfather, and my mother and aunties were more than happy to help me fill in the blanks. The Hawaiian aspect of Anthropoidea was because I wanted to include some more interesting aspects to the story, as if a monkey curse wasn’t enough. I also realized that in all my years of voraciously devouring books, I had yet to come across a story that embodied a modernized and Mainland-ized view of Hawaii. I’ve lived in California my entire existence yet have visited my family in Hawaii more times than I can remember. I was eager to share my perspective as a Mainlander who still lived and breathed Hawaiian culture even from two-thousand miles away. Now let’s get into kahunas, a favorite topic of mine. Though there were a few kahunas in my family (at least one was an herbalist, one a healer, and even my grandmother practiced kahuna-like rituals, according to my mom), I was unable to find any ancestral kahunas of mine that were considered more of witch doctors, like a kahuna ana’ana. Plus, all my extended kahuna relatives are long dead, and not much is known about them nowadays by my existing family. Luckily, I happened to visit Kauai this past July with my in-law family just as I was starting to edit Anthropoidea. On a whim, I asked a staff at our resort if anyone who worked there knew anything about kahunas. She seemed taken aback, but directed me to a man named Troy who taught the water aerobics classes. I was able to catch him before a class and talk with him for a bit, and he provided me with enough information to tie up my remaining loose ends on the Hawaiian aspect of the story. He was even kind enough to share personal accounts of his and his family, which provided details I could add to the book. He was the one that told me that seeing a centipede in Hawaii—especially in your house—is a bad omen that a kahuna is sending you bad “ju-ju”, as Troy put it. He also shared with me that he was a practicing kahuna, but made it abundantly clear that he only worked in white magic. I am certain had I not met Troy, something would be majorly lacking in Anthropoidea. It’s funny how you tend to come across the right people at the right moment, that kind of synchronicity is always a friendly reminder to me that I am on the right track. Lastly, a part of Anthropoidea that I feel needs to come off my chest—as if putting it in a book wasn’t enough—is the side story about Stella being kicked out of her band, Crystal Clear. Like Stella, I used to play bass in a band that did fairly well: we played shows practically every weekend, had a “following” so to speak (mostly friends, but that’s what made it so fun! ), and yes, I was the only girl in the group. My old band, The Big O, consisted of three high school friends (including myself) and a drummer we met while in college. None of my band mates were actually related to me, but one of them I considered like a brother, while the other and I had our ups and downs. I guess one day he had finally had enough of me (coincidentally enough, the day after he attended my engagement party where we took a bunch of really cute band photos), and he called me and officially kicked me out of the band. None of my other band mates would stand up to him, so that was the end of my reign in The Big O. The whole thing hurt me so deeply that I knew I needed to find an outlet for my pain and frustration, and that’s the thing with writers: if you piss us off, expect to read about it at some point. Maybe not our next book, but if you really affected us, it will be in a story somewhere. In my opinion, it’s the best way to make peace with a situation. Once I added in the parts about Stella being eliminated from the band, I felt a weight lift off my shoulders. I could forgive, and though I wouldn’t forget, I could move on. The saddest part of my personal experience, however, is that my friend who kicked me out of our band committed suicide two years later. There are still days where I feel angry and hurt—but nowadays it has nothing to do with our band, it’s because he left many people who loved and cared about him. I wish that he could have just stuck it out and seen where his life would have gone, because he was not only an incredible musician, but an inspiring artist and overall fun person to be around. I miss him, and hope he’s jamming on the guitar with some angels at this very moment. I could ramble on about Anthropoidea for days, and still never finish sharing everything I’d want to about the book. The only way to truly experience Anthropoidea in all its glory is to read it for yourself. I hope you enjoy it, and happy reading! I hope you enjoyed this behind-the-scenes look at Anthropoidea. Excited to read the book now? You’re in luck! K.L. is giving away a signed paperback and a tarot reading to one lucky winner! Anthropoidea is available now on Amazon! 1. ↑ Side note: It is yelling! Though in a jovial, playful teasing kind of way. But still loud! I remember my uncle used to scream “Hey haole!” at the top of his lungs to my father in crowded places just to embarrass him. I’ve had family yell “Eh!” at me probably a billion times, and now I find myself doing it to my own daughter.